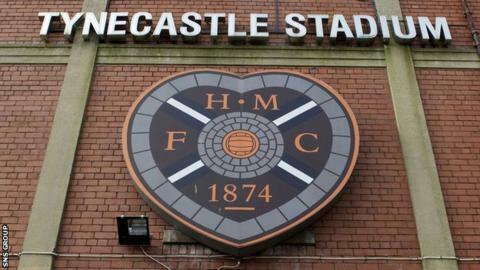 Hearts' wait for a possible route to exit administration goes on. Creditors of major shareholder UBIG have agreed to transfer their 50% holding to BIDCO, the Anne Budge-backed vehicle for future fan control. Talks will continue between lawyers representing the failed Lithuanian bank and Hearts' administrators (BDO). With BDO worried that club funds will dry up by the end of April, a decision from Ukio's creditors is a matter of urgency, with fans' group Foundation of Hearts saying on Twitter that "a formal meeting is expected by the end of next week". Budge, the sole director of BIDCO, is offering around £2.5m for the Ukio shares. UBIG creditors are set to receive a much smaller sum of between £50,000 and £100,000 following the statutory 20-day notice period. Failure to deliver a deal soon could see the Edinburgh club move towards liquidation - following their weekend relegation from the Premiership. Prior to Monday's meeting of UBIG creditors, Bob Jamieson told BBC Scotland that he was ready to make a late offer but only in the event that Budge's bid failed. Perhaps trying to move the process along, Budge had intimated that she was ready to walk away if creditors refused to ratify the transfer of shares. A late offer was also submitted via email - likely to be from Pat Munro, who has been credited with several attempts to take over Hearts. But a spokesman for the Ukio bankruptcy administrator told Press Association Sport: "The form and content of it is beyond consideration - all financial proposals should be provided to BDO." Foundation of Hearts chairman, Ian Murray MP, described these interventions as "unhelpful". "It's quite clear that some approaches have been made in terms of other potential bids but you have to go through the proper process," Murray told BBC Scotland. "We got preferred bidder status back at the start of August. "The CVA (Company Voluntary Arrangement) proposal was agreed at the Hearts CVA meetings in November, so we've gone through a tremendous process here. "And it's quite unhelpful to have interjections at the 11th hour. This is dire for the club if the outcome is not positive." Budge intends to be at the Tynecastle helm for at least three years and does not plan to seek repayment for her outlay for at least two years to allow money raised by fans to be used as working capital. And FoH has estimated that fans will need to raise £6m over the next five years "to achieve the objectives of saving the club over the long term and moving into supporter ownership". Hearts entered administration in June with debts of around £30m and BDO's Bryan Jackson had hoped a deal would have been concluded long before now. Talking to BBC Scotland last week, he said: "It's always been lurking there but we've never wanted to use the L-word (liquidation). "We've always tried to remain optimistic and things have been going quite well in terms of overcoming obstacles. We got through the CVA and then when we had the memorandum of understanding on the shares, which we thought that was a real giant step. "We thought the last step would be much simpler - the consents of creditors - and we saw no reason why that wouldn't be obtained. "We will be pushing for a decision but we're not going to panic on 8 April if we get a bad outcome or another delay."